The body believed to be of an airman killed on a flight over Kings Canyon National Park protrudes from the ice. A hiker preparing a book on an ill-fated World War II-era plane that crashed in Sequoia and Kings Canyon National Park found the remains of a man believed to be a crew member on that flight, authorities said Monday. The remains were found Wednesday, 150 feet from those of another airman, discovered inside a Sierra Nevada glacier in 2005, said Fresno County Coroner David Hadden. The hiker "was there to look for evidence in the glacier of the crash," Hadden said. Last winter's light snowfall and the warmer than normal weather melted the ice around the remains, making them more visible. "It looks like his head was just resting on the rock," said Debbie Brenchley, the first Sequoia and Kings Canyon National Park ranger on the scene Friday after the body was found. "You can see he has a wool sweater on and a white collar and a ring on." The remains were being taken to the Fresno County morgue Monday. Haddon said his office was awaiting the arrival of an anthropologist from the U.S. Joint POW/MIA Acting Command in Hawaii. Then, he said, "we'll be doing a thorough examination" to determine the body's identity. On Nov. 18, 1942, an AT-7 navigational plane took off from an Army air base in Sacramento on a training flight. It was caught in a blizzard and disappeared. Five years after the crash, a hiker on 13,710-foot Mt. Mendel found wreckage and clothing from the flight. Four airmen were killed: Cadet Leo Mustonen, 22, of Brainerd, Minn.; Cadet Ernest Munn, 23, of St. Clairsville, Ohio; Cadet John Mortenson, 25, of Moscow, Idaho; and 2nd Lt. William Gamber, 23, of Fayette, Ohio. 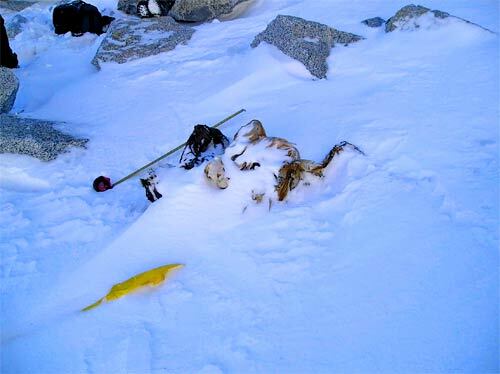 In October 2005, Mustonen's ice-covered remains were found on Mt. Mendel. California and the world. Get home delivery of The Times from $1.25 a week. Subscribe now. A beach community frets that its surfer statue is more goofy than graceful. "Venice" is more than just Muscle Beach! View our readers' photos and share your own at Your Scene.